Rims = Mavic CXP22 700c. stem & handlebars = tommaso Alloy. front derailleur = SRAM Rival. Shifters = SRAM Rival double-tap. rear derailleur = SRAM Force 10 speed. and matching Carbon Fiber Fork. Bar wrap is dirty and worn. Rear derailleur = Shimano Ultegra 10 speed. front derailleur = Shimano Ultegra. Crankset = FSA SL-k carbon fiber 172.5 mm. Rims = Easton circuit 700c. stem & handlebars = 3T Alloy. Carbon Fiber Fork e'. Front Derailleur Shimano Acera Top Swing. Rear Derailleur Shimano Alivio long cage (H normal / not rapidrise). Brake Levers Shimano ST-EF50. This bike has a couple minor issues. scuffs on cranks and scuffs on drop outs. This Bike also has a color matched carbon fork. Shimano Ultegra 6600 Rear FRONT NOT INCLUDED. Shimano Ultegra 6600 STI 30 speed. TEKTRO R530 Black Polished Aluminum Dual-Pivot Calipers / Shimano Ultegra 6600 STI Levers. 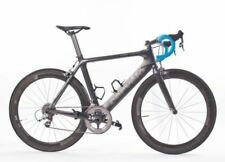 The bike has a campagnolo headset, shimano 105 3x9 integrated shifters, shimano 105 triple crank, shimano tiagra front derailleur, shimano 105 rear derailleur, mavic wheels, and cannondale brakes. There are two noticeable imperfections in the paint, on the seat tube and on the top tube, both of which are pictured. 50cm fits most cyclist 5'3" to 5'5". But here's the deal. ALL OF OUR BIKES HAVE ISSUES. Cog 16T Fixed Gear with 3 Speed Gear ratios available by shifting the bar-con lever. (up to 50cm: 90mm, 53cm :110mm). This Bike also has a color matched carbon fork. Shimano 7800 Dura Ace 10 Speed 12-25T, Shimano CNHG7800 Dura-Ace 10spd Chain. Shimano 7800 Dura Ace 10 Speed (20 Spd total) front and rear. Shimano 7800 Dura Ace 10 Speed STI (20 Speed total). Front Derailleur SRAM X9 10SPEED, 31.8mm clamp. Shifters SRAM X9, 30 speed trigger shift. Rear Derailleur SRAM X9 10SPEED long cage, for 30 Speed. Cassette/Freewheel SRAM 11-36t 10Speed. This bike has a couple minor issues. scuffs on cranks and scuffs on drop outs. Wellington Sizing Guide. 50cm fits most cyclist 5'3" to 5'5". Fork Kinesis TaperBlade CARBON Fiber. Bike Island site caters to the do it yourselfer that knows their way around a bike, has the tools and knowledge to make things work. Fork/Headset CrMoly 4130 700C STEEL FORK, STEERER: 1-1/8" THREADLESS, BLADE: 28.6 OVAL, eyelets / Ritchey ball bearing headset. Bike Island site caters to the do it yourselfer that knows their way around a bike, has the tools and knowledge to make things work. This bike has a couple minor issues. scuffs on cranks and scuffs on drop outs. A little dusty from living in the cardboard box. Dirt is not from riding, this bike is kind of like a barn find. it's been sitting quietly waiting for you for almost 10 years! 53cm fits most cyclist 5'6" to 5'8". (up to 50cm: 90mm, 53cm :110mm). But here's the deal. ALL OF OUR BIKES HAVE ISSUES. Cog 16T Fixed Gear with 3 Speed Gear ratios available by shifting the bar-con lever. Shifters Shimano Deore Rapid Fire 27 speed trigger shift. Front Derailleur Shimano Deore. Rear Derailleur Shimano LX long cage. Cassette/Freewheel Shimano HG cassette 9 speed 11-32T. This bike has a couple minor issues. scuffs on cranks and scuffs on drop outs. Shimano LX, 31.8 clamp, Shimano XT Shadow, Low-profile design, SGS Long-cage, Top-Normal. Shimano LX RapidFire Plus 27 speed, Trigger shifter. Shimano HG cassette 9 speed 11-32 /Z9000 super narrow 9 speed. Front Derailleur SHIMANO FRONT DERAILLEUR, FD-M671-A, SLX,TRIPLE, DOWN-SWING DUAL-PULL BAND TYPE (W/31.8MM ADAPTER), FOR 40/42T. Shifters SHIMANO SHIFT LEVER, SL-M670, SLX(30 gears total). Rear Derailleur SHIMANO REAR DERAILLEUR, RD-M781, DEORE XT SGS 10-SPEED TOP-NORMAL, SHADOW DESIGN. A great fitness-level bike suited for those first few years of triathlons or organised charity rides, the Finest makes it easy to grow into the sport. The adjustable stem allows one a more custom fit. Fork Rock Shox Reba 29 SL Air, 80mm Travelw/Remote PopLoc. Windsor Cliff 29 Team in 19"(center to top) in White. Front Derailleur SRAM X.9, 34.9mm. Shifters SRAM X.9 Trigger, 27-speed. Cassette/Freewheel SRAM PG-950, 11-34T 9-speed. 2017 Cannondale Trail. This bike is part of our Demo and Display fleet - in other words, it may have been test ridden once or twice, used for photographs or was a display model on the sales floor this year, but is not considered "used" in the traditional sense. BMC Teammachine SLR01 with SHIMANO Ultegra Di2 (including pedals). THIS IS A 2016 SLR01. YOU CAN LOOK ON BMC'S WEB PAGE AND SEE THE 2016 "CATALOG ARCHIVE" AT THE BOTTOM OF THE PAGE! Ultegra 11-28 cassette with new Shimano chain! An amazing value and a beautiful bike in the rare Acid Tangerine matte finish. 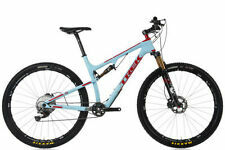 I believe this to be a 2013 Model Trek. Condition is Used, but has had limited use. Rear Derailleur Shimano 105, (RD5600). Front Derailleur Shimano Tiagra Clamp-on. Shifters Shimano Tiagra STI (integrated brake shift) 9-speed. Sizes 48cm. Cassette/Freewheel Shimano HG-50, 9-speed, 12-25T. Front Derailleur Shimano XTR FD-M970. Rear Derailleur Shimano XTR RD-M972 Top-Normal Shadow with Carbon pulley cage. Shifters Shimano XTR RapidFire Plus 27 speed SL-M970 with push-pull release (Double Action). INCLUDES ORIGINAL DAHON CARRYING BAG. 20" WHEELS WITH SEALED HUBS. Brompton is in full working order. Wellington Sizing Guide. 50cm fits most cyclist 5'3" to 5'5". Front Derailleur Shimano Sora FD2203 for triple. Rear Derailleur Shimano Sora 8 speed (24 gears total). Shifters Shimano 2200 STI 8 speed (24 gears total) (integrated with brake levers). Chris King threadless headset and Reynolds carbon fork with carbon steerer tube are included. Shimano SLX, 31.8 clamp, Shimano XT Shadow, Low-profile design, SGS Long-cage, Top-Normal. Shimano SLX RapidFire Plus 27 speed, Trigger shifter. Shimano HG cassette 9 speed 11-32 /Z9000 super narrow 9 speed. Mavic Ksyrium sealed QRM bearings. Shimano Ultegra 6800 11 Speed (22 Spd total) front and rear. Shimano 22 Speed CS-6800, ULTEGRA, 11-S, 11-12-13-14-16-18-20-22-25-28-32T, Shimano CN-6800, ULTEGRA, FOR 11-SPEED, 108 LINKS. SRAM--10 speed Red levers, Red brakes, Red rear derailleur, Rival front derailleur. Dura Ace 172.5 cranks and Ultegra 10sd cassette. Profile Design bars/stem and carbon bottle cages. Mavic Ksyrium SL wheels with Kenda 25c tires that are barely used. Bicycles are available in many designs for different styles of riding. 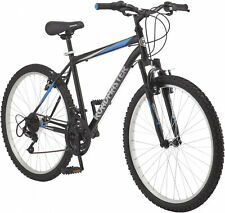 Mountain bikes and road bicycles, for instance, are two of the most common varieties. Understanding bike features and saddle heights will help you make an educated decision about your bicycle purchase. 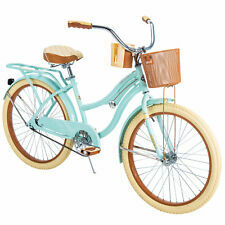 Which styles of bicycles are available? 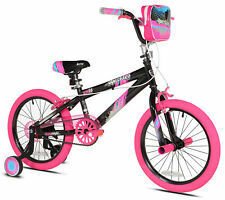 BMX bikes, cruisers, Cyclocross bikes, hybrid and comfort bikes, kids bikes, mountain cycles, racing road bikes, and touring road bikes are some common styles. Each has distinctive features that help to adapt it to the particular ground, pace, and agility level. What are the features of a typical mountain bike? These bicycles may look like any other sort of bike, but they are adapted to ride on difficult ground conditions with ease, including rocks, mud, and tree roots. Usually, mountain bikes have front or full suspension that allows for more bounce than other frames. Their tires are large and include lots of traction and knobs on the treads. The wheels are also more durable so that they are not disturbed by rocks and natural debris. The brakes are appropriately more powerful to stop the rider short of a cliff or body of water when necessary. Lower gear ratios are also included for climbing very steep terrain. 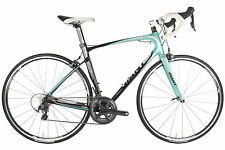 What are the features of a typical road bike? 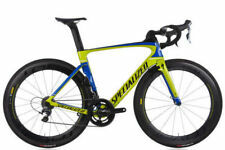 Usually, road bikes are made of lightweight material with a composite or carbon fiber front fork. Often, the handlebars are curved under like the horns of a ram. Narrow wheels and tires keep the bike aerodynamic, and there is rarely front or rear suspension. These bikes are designed to be ridden on pavement, like roads and bike paths, rather than on tough terrain. Due to their design, riders can go farther and faster on road bikes than with other bike types although these are not designed to carry a lot of supplies. How do you properly adjust a bicycle seat? Ensuring proper saddle height decreases the risk of knee injuries. To measure the correct seat height for you, stand barefoot with your feet about shoulder width apart. Place a yardstick between your legs and pull up slightly to mimic a bicycle, then make a mark on the wall at the height of the yardstick. Measure from the mark to the floor, subtracting 10 centimeters from the measurement. Measure your final calculation height from the middle of the bottom bracket to the top of the saddle, and adjust your bicycle accordingly.